That's why we think "Anti-Malware" is the more appropriate term, even if it's the same as what's commonly known as "Anti-Virus". How does it scan faster with two scanners than most others with just one? Emsisoft Anti-Malware Home not only detects more because it uses the full power of two major antivirus- and anti-malware technologies, it also scans quicker because of the efficient combination of the scanners. 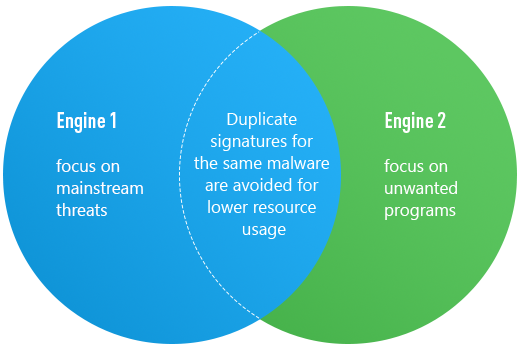 Any unnecessary duplicates in detection are avoided, enabling the least impact on memory and overall hardware resources. In Internet security, “PUP” stands for “Potentially Unwanted Program”. These are unneeded browser toolbars, adware and other annoying software that typically gets installed with freeware software downloads. If you unintentionally try to view a website that spreads trojans, spyware, or any other type of malicious software, Emsisoft Anti-Malware Home will prevent you from connecting and getting infected. This real-time protection layer checks all downloaded and modified files with the awarded super-fast Emsisoft dual-engine scanner. The best: You won’t even notice it’s there for you 24/7. To stop brand new threats that aren't yet known by signatures, Emsisoft Anti-Malware Home continually monitors the behavior of all active programs and raises an alert as soon as something suspicious occurs. Custom-built behavioral monitoring stops ransomware before it can encrypt any files. Stops Ransomware. Before it encrypts your files. Emsisoft’s Anti-Ransomware protection layer is custom-built to detect behavioral patterns of ransomware attacks and stop them before your files can be encrypted. Other anti-ransomware solutions rely on detection of repeated encryption, so your most valuable files may already be lost before they act. Emsisoft Mobile Security is our first response to the world of mobile malware. It is a next-gen security solution for Android devices focused on little to no system or battery impact while providing access to a number of security functions in order to help you have a safer and more informed Android experience. Protect your Android smartphone and tablet from dangers awaiting on the Internet. Our malware removal experts will guide you to clean your system if required. Receive a full refund for up to 30 days after purchase if you’re unhappy. Always receive all new software versions at no extra cost via auto-update. Committed to maximum efficiency and protection, without slowdowns. Challenge our first-class support team with any questions around the product. Convince yourself about the quality before purchasing anything. We don’t betray our customers or sell their data for quick cash. Can it replace my antivirus? Absolutely. Emsisoft Anti-Malware Home is a complete antivirus solution that provides protection against all manner of threats that are lurking on the internet. Why is it called "Anti-Malware" and not "Antivirus"? Our lab has determined that classic viruses only make up less than 0.5% of total threats (in 2016). Using "Antivirus" would therefore be wrong by definition. We're perfectionists so we have elected to use the broader term "Malware" as it stands for all kinds of online threats. Basically any PC that is able to run Windows 7, 8 or 10. All features are available on x86 and x64 systems. Make sure you always have the latest service packs and security updates installed. Where can I get answers on any other questions?